Through the various benefits of heat and the undeniable power of touch, you’ll experience a results – oriented body treatment like never before.Starting with body mapping & dry body brushing, each Dermalogica Thermal Body Therapy Treatment is customised for your skin condition, designed to target your skin’s most pressing concerns while delivering an amazing sensory experience. Using either a gentle Oatmeal and Rice Bran powder or a mineral salt scrub your skin will be exfoliated & dead skin cells will be removed. It brightens skin and helps reduce the appearance of sun spots and hyperpigmentation. Skin is smoother and prepped for maximum absorption of rich, smoothing botanical oils. You’ll leave this therapy with silky, healthier skin. Stimulate circulation while smoothing skin with this body wrap therapy that promotes skin nourishment. Natural earth clays draw out impurities while Tropical Asian Ginger and White Tea stimulate circulation and smooth skin. Customised essential oils provide aromatherapeutic and skin benefits while Caffeine provides all-over toning. Rest in a warming wrap that induces blood circulation all while encouraging absorption of nourishing botanicals. Includes a scalp massage. An intense wrap therapy dedicated to feeding your skin with the nourishment it craves. A unique blend of Wheat Protein and Honey act as maximum hydrators while Wasabi, Ginger and White Tea stimulate blood circulation to promote healthier skin. Customised essential oil blends in a massage medium offer aromatherapeutic benefits, while rich Kukui Nut, Olive and Grape Seed oils smooth and provide antioxidant protection. Includes a scalp massage. 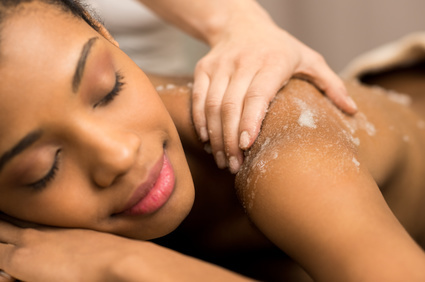 A perfect combination of the body exfoliation therapy & a choice of a body wrap treatment. Includes a scalp massage. This ultimate customised treatment includes thorough exfoliation, a full swedish body massage, hydrating body wrap & a scalp massage. Inspired by the practices of 14th century Thai Therapy, this Thermal Body Therapy Treatment utilises a unique fabric stamp filled with skin benefiting ingredients and the power of heat to detoxify, remineralise, de-stress, exfoliate and relax. Natural earth clays draw out impurities while Tropical Asian Ginger and White Tea stimulate circulation and smooth skin. The deep manipulations along the pressure points and the meridian of the body relieve aching muscle tissue and work to rebalance the body. As the above treatment with the addition of a thermal sea mud wrap & a relaxing scalp massage. A deep cleanse & exfoliation under steam to draw out impurities from the skin. Electrical modalities are used, followed by extractions, a purifying masque, toner & skin protection.